We are delighted to have Kairava Gullatz exhibit a brand new body of works in the gallery for the first time. This exhibition coincides with the prestigious Portage Ceramic Awards at our friends Te Uru Contemporary Art Gallery of which she was a finalist in 2017. Kairava’s work is not only functional but delicate and decorative, taking inspiration from her surroundings, nature the sea and the sand. Her ‘quirky’ native birds are transformed into functional jugs that look beautiful on any table. Known for her workshops and classes across West Auckland it is a delight to have this popular ceramic artist display her works in our space. "I enjoy the ‘centering’ process of throwing pots, loving to be in touch with the soft material and shaping each vessel as a unique form. While exploring hand-building techniques, it is figures of creatures which inspire me. Time flies at my studio when assembling body parts, playing with proportions and facial expressions are so fascinating to me. Using colour in a playful way, painting eyes, creating textures while layering slip colours, adding sand or brass to the mix, dripping or brushing on glazes, all of it is my never-ending journey of explorations and creative expressions with clay." 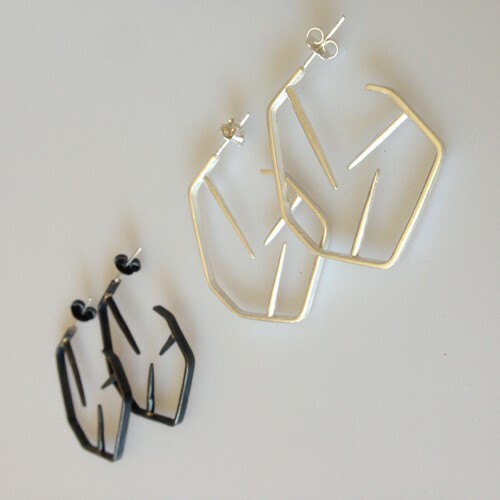 Joining Kairava is Piha based jeweller Julia Marin. Julia's works explore possibilities within minimalist compositions practising traditional silver/goldsmithing techniques and focusing on sustainability through the choice of materials and by producing collections of one-off pieces in limited editions. She specialises in custom jewellery, particularly remodels. 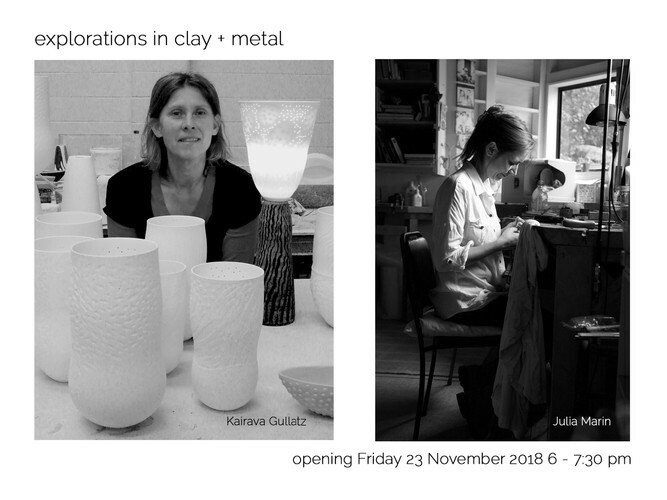 Explorations in Clay + Metal promises to be a wonderful collaboration between 2 very unique and talented artists, come along and find a beautiful handcrafted gift for Christmas. Join us as we celebrate the opening of this spectacular show on Friday 23 November from 6 pm to 7.30 pm. On show through to Sunday 16 December, open daily from 10 am to 4 pm.